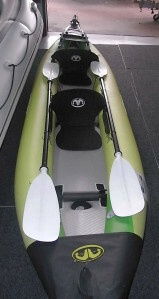 Brand New Aqua Marina K2 2 person inflatable kayak package with 2 breakdown paddles, 2 backrests, a double action hand pump and a carry bag. 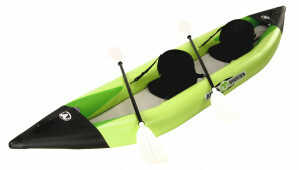 Other features include; super strong re-inforced polymer material, welded seams, high pressure airdeck floor, self bailing hull, 2 fully adjustable extremelly comfortable backrest, 2 x footrests, top quality recessed valves, 2 rubber tracking skegs, carry bag, 2 x split paddles, a double action hand pump and optional rudder kit!!! Can be rolled up in seconds to fit into the boot of the smallest car!